Matthew McConaughey is still feeling alright, alright, alright in the first trailer for his new drama “Gold” — probably due to the fact that he literally strikes gold. Black Bear Pictures financed the film, with Black Bear’s Teddy Schwarzman and HWY 61’s Michael Nozik serving as producers alongside Massett, Zinman, and McConaughey. HWY 61 partner Paul Haggis, Richard Middleton and Black Bear’s Ben Stillman are executive producers. TWC-Dimension will distribute the film. “Gold” will premiere in theaters on Dec. 25. 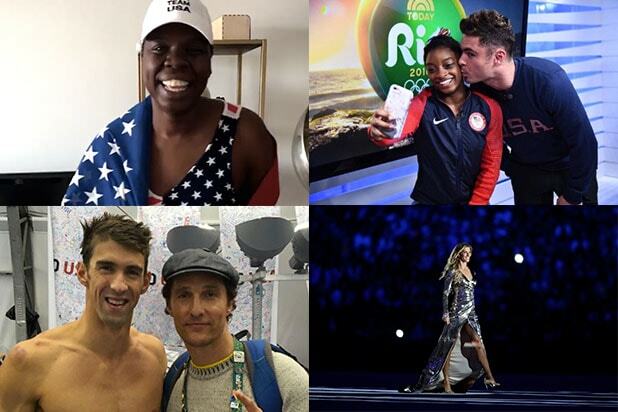 Many actors and models flocked to Rio de Janeiro to support their teams in the 2016 Olympic Games. On Tuesday, four-time gold medal-winning gymnast Simone Biles finally met her crush. She shared several photos and even a video of the actor giving the star Olympian a quick kiss on the cheek. The actor also promised Biles' teammate Aly Raisman a pizza date. The supermodel stole the show at the opening ceremony as she took the final catwalk of her career and danced with people in the crowd. The "Free State of Jones" actor has been extremely supportive at games like swimming, beach volleyball and rugby. He also sent a congratulatory tweet to Michael Phelps. The three-month-old son of Michael Phelps stole the show while his daddy was winning five gold medals in Rio. He also dressed in patriotic attire such as stars and stripes and, in between Phelps' wins, the star swimmer rushed to his son's side to shower him with kisses. Boomer's Instagram account has over a half-million followers. Draped in the American flag, Jones has been cheering for U.S.A. with passionate patriotism that NBC — the official network that’s airing the Rio games — couldn’t help but notice. She was then enlisted by the network to cover the Games in Rio. The "Ghostbusters" actress has since been live-tweeting almost all events. The supermodel carried the Olympic torch through the streets of Rio during the Opening Ceremony. "I am grateful to experience this incredible honor and dream to carry the Olympic torch, so humbled to be carrying in my home country," she wrote on Instagram. Both Ambrosio and Lima were announced as NBC's food and culture correspondents for the Olympics in July. Ambrosio's Instagram is full of pictures all-things Olympic Games. The "Fantastic Beasts and Where to Find Them" actor flew to Brazil as a brand ambassador for Omega watches. He has also been taking tons of photos with athletes, like British politician and former track and field athlete, Sebastian Coe. The model declared her support on Instagram, posting a photo from her Vogue cover shoot with decathlete Ashton Eaton. "Wishing my @voguemagazine cover bud, Ashton @weareeaton, and all my @TEAMUSA friends an incredible, safe, and successful Olympic Games!!" she wrote.